This post was written by Kristi Stone of Stone Family Farmstead. Pinto beans are a huge comfort food for my husband and I. We were both raised on them–me, through my Grandma Gloria, who often made “beans and sopa”, or tostadas with her awesome refried beans (awesome because grandmas always add that extra “love” to their cooking); and my husband, through his Grandma Esther. My grandma always used canned beans, which I grew accustomed to, and loved. My husband’s grandma always made hers from scratch, and they were amazingly delicious. I knew coming into this marriage that beans would be an oft-eaten fare in our family, and now, two of the three of our adult children make pinto beans standard fare in their homes. This is the reason I wanted to learn to can pinto beans. Why Can Pinto Beans? Aren’t They Cheap Enough? 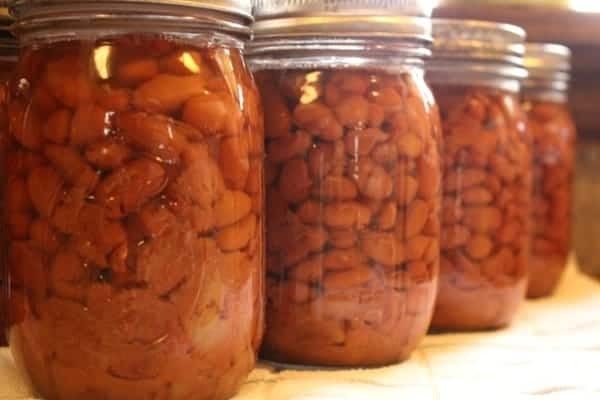 Canning pinto beans is definitely a money saver. Though beans in general are pretty cheap at the store, dry beans are even cheaper, and often pints (comparable to the small 15 oz cans on the store shelves) can be pressure canned at pennies on the dollar, versus a whole dollar per can. Right now, pinto beans cost me about a dollar per lb. unless I purchase them in large bulk amounts (I don’t). Even at a dollar a pound, I can still can pinto beans at .28 to .33 per pint (not counting anything but the beans, that is). It’s really very cost effective, and if you consider that beans can be stored on the shelf for 1-2 years, that is a fantastic savings of 2/3 the cost of commercially canned beans. But Isn’t it Pressure Canning Dangerous? For some, pressure canning can seem scary. It is a little nerve-wracking at first. Canners don’t just blow up, the way people think they can. Just like anything else, if you learn and follow the rules of pressure canner use, you will get good results. Your canner will come with specific instructions that you will follow, which are basically the same as using any other pressure canner, but with a few small differences. Make sure to read through your canner’s directions for processing, and you should be fine. Matter of fact, with all the savings you’ll be incurring, you’ll be more than fine! 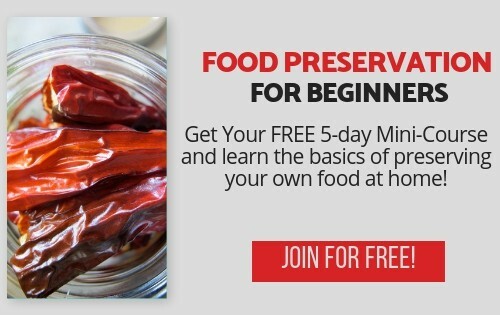 Check out my Food Preservation Planner to help you plan your food needs more efficiently! 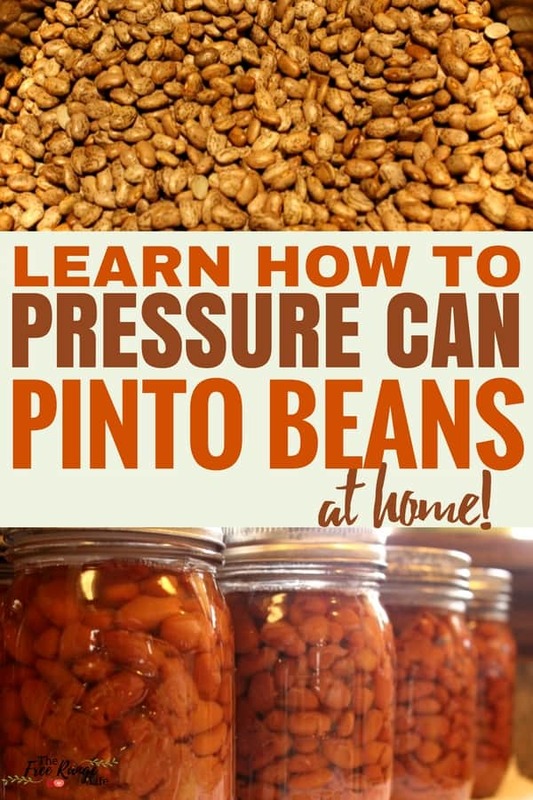 You need to use a pressure canner (NOT a pressure cooker) to can pinto beans that is large enough to accommodate the amount of beans you are canning. You will want to make sure that you can fit all of your jars into the canner at the same time, which means that you will want to can only what you can fit into the canner that you have. According to the Ball Blue Book, you will need 3/4 pound dry beans for every quart (or two pints) that you want to can. Sometimes that varies, so I will provide the amounts I usually work with in the recipe. The canner I use will fit up to 17 pint jars, double stacked (using an extra canning rack), or 7 quarts. Make your beans. Place pinto beans in a large pot and cover with water by about 2 inches. Bring beans to a boil for two minutes,remove from heat and let sit for one hour. Drain. Refill pot with water, covering beans again by two inches, and heat until boiling. Boil for 30 minutes, stirring frequently. You can do the next two steps while your beans are boiling. Add water to your pressure canner. Fill up your pressure canner with water according to the canner instructions and heat until softly boiling. As an optional step, you can add 1/4 cup of white vinegar to the water to eliminate the cloudiness that mineral deposits can leave on your jars, rings, and lids. It’s not detrimental to the safety of your food, but in the end, your jars look nicer on the shelf. Wash your jars, lids, and rings. While your water is coming to a boil, wash jars and rings thoroughly. Put both aside until you are ready to use them. Heat your jars. 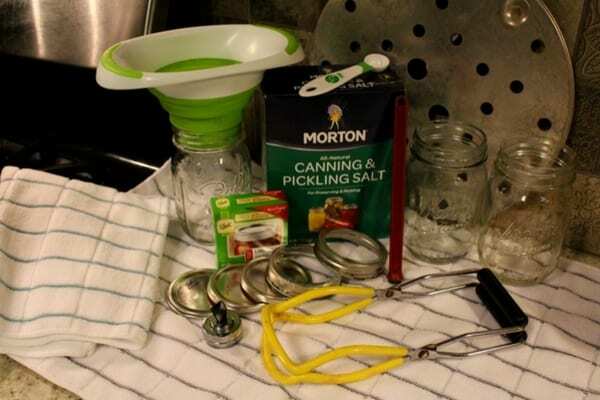 There are many ways people use to heat their jars, and once upon a time, we all sterilized our jars (or tried to) before we canned our foods. 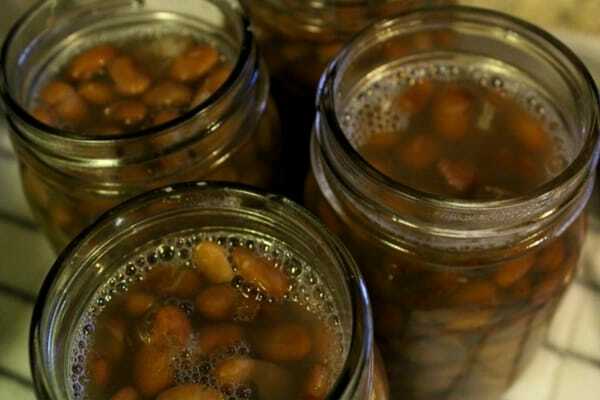 Since we don’t need to sterilize our jars for pinto beans, simply put the jars into the boiling water, wait 2-3 minutes for the jars to heat enough to be able to handle the hot beans and liquid. Skipping this step could stress the glass and cause jars to break while filling. Fill your jars. One-by-one remove the jars and fill them with beans, leaving 1 inch of headspace. Add 1/2 tsp. salt per pint hot jar (1 tsp. if you are filling quarts), if desired. The salt is added only for flavor, and not to preservation of the beans. Ladle hot liquid into the jars to cover beans, maintaining the 1 inch of headspace. If you notice you are running out of liquid to cover the beans in the jar, no problem, just use hot water from your teapot to fill jars the rest of the way. Run a butter knife (or the non-magnetic end of the jar lifter) around the inside sides of the jar to move the beans around, allowing any air bubbles to escape the jar before sealing. Wipe around the rim of your jars with a clean damp rag to prevent any liquid from interfering with the sealing of your jar. Put your lid on, then add a ring, only to finger tight, or just until you feel resistance between the ring and the jar. You want to be careful not to muscle the ring and make it air tight–finger tightening will allow any bubbles left inside the jar to escape during the canning process. Repeat the process until all jars are filled. Fill your canner. Once all of your jars are filled, wiped, topped with lids and secured with rings, you are ready to fill your canner. With you jar lifter, carefully lift your jars and place them on the canning rack in the bottom of your canner. Jars should be about an inch away from each other and the sides of the canner, so that water can circulate evenly around each jar to ensure even heating and safe processing. If you have filled pint jars, you will need your extra canning rack to place any jars that don’t fit on the bottom rack. Do not skip the extra canning rack–jars jostle around quite and can break in the canner if any on the top layer fall over. Trust me! Once your canner is full, place the lid on the canner and secure/lock it according to the instructions for your canner. Turn the fire on high. Watch for your canner to begin letting off steam. Once it starts to do this, put your timer on for 10 minutes and allow steam to escape through the vent. This ensures that all air is exhausted in the canner and jars. Not allowing air to exhaust from the jars can cause uneven heating in the jars. Let your canner build up pressure. Once ten minutes has passed, place your pressure regulator onto the vent and wait until it builds up to the desired pressure. According to the Ball Blue Book, pinto beans should be canned at 10lb pressure for 75 minutes for pints, or 90 minutes for quarts. If your city’s elevation is above 1000 feet above sea level, however, you will need to make the proper adjustments. My city’s elevation is 1489, so I need to can my beans at 11lbs pressure if using a dial gauge canner, and 15lbs pressure if using a canner with only a pressure regulator. Start timing. Once you canner has reached the proper pressure, turn your burner as low as you can while still maintaining the same pressure. The reason for this is that if the liquid in the beans boils too vigorously in the jar, it can get under the lid, preventing/hindering the lid from sealing to the jar. Turn your timer on for the appropriate amount of processing time, 75 minutes for pints, or 90 minutes for quarts. Allow the canner to depressurize. Once processing is finished, turn off the fire and leave the canner in place, allowing it to depressurize. Do not remove the pressure regulator to attempt to depressurize the canner more quickly, which can result in broken jars and/or under-processed foods. Open the canner. When your canner is fully depressurized, you can remove the lid and see all of your wonderful handiwork! Allow jars to sit untouched for about 10 minutes while you set out a kitchen towel on a counter where you will allow your jars to cool completely. Using your jar lifter, remove each jar carefully and place them on your towel at least an inch apart and allow them to sit with rings intact for 24 hours. Remove the rings. After 24 hours, remove the rings and check the seals on all of the lids. If any of your jars did not seal, put the ring back on and store the jars in the refrigerator and plan on using those within a few days. Wipe any residue off the jars, then label your jars (type of food, date) and store on your shelf. Use within 1-2 years. These beans are fantastic in chili, burritos, taco salad, as a side with tacos or enchiladas, on tostadas, or anywhere you would use store-bought canned pinto beans. Add my lacto-fermented jalapenos as an added kick! Enjoy! Kristi is a Southern California beach girl gone rural who aspires to a more natural lifestyle through farming, gardening, and herbal living. She lives in Sunny Southern California on a one acre hobby farm with her husband and youngest adult daughter. Now that she and her husband Todd are finished raising their three awesome children, they raise dairy goats, chickens, gardens, trees, and sometimes a grandson! They aspire to raise their own milk, eggs, and produce, and to enjoy all that their forever home has to offer them. Follow Kristi on her blog, Stone Family Farmstead or on Facebook. Shared on my Facebook page and will be pinned shortly! My beans turn to mush when I let them go at 10 lbs of pressure for 90 minutes. Did yours not do this? Great article. I have a stove top American pressure cooker. Pressure cooking qt jars of pintos. My elevation is 178 feet. Would you say 10 pounds of pressure and can for 90 min? Is the canning process/time the same if you add fresh cooked garlic, onion, cilantro and spices to the recipe?